With the digital age fully upon us, it’s time for treatment plants to evolve beyond preventative maintenance and embrace predictive maintenance. Traditionally, maintenance was based on failure. We fired up our systems, and when something broke, we rushed in and fixed it. This has proven to be costly — very costly. The first big cost is for parts. Either we have to warehouse a spare for every critical piece of equipment, or we have to expedite delivery from a vendor. Both are cost-prohibitive. The second major cost comes with the process downtime. If you lose a pump, everything downstream of that pump goes out of commission. Don’t make the mistake of thinking this applies only to major feed pumps. If a chemical injection pump fails, the entire line then can go out of compliance, and you have to shut it down for repair. There is a fourth cost to the “run to failure” mode that most do not stop to consider. If you wait until a bearing fails completely in a pump, think about how much collateral damage that can cause. What if it allows your impellers to contact the housing? What if it allows a significant leak? What if it takes the drive motor out with it? The cost of “run to failure” is so high that almost nobody does it anymore. Today, and for quite some time, a paradigm of “preventative maintenance” has prevailed in most facilities. This is definitely a step forward. Historically, it has reduced maintenance costs by about one-third. Preventative maintenance relies on equipment history and statistical techniques to determine a theoretical mean time to failure. Using this calculated result, a company will order replacement parts, schedule turnarounds and area shutdowns, and prepare staff or hire outside contractors for scheduled maintenance. This sounds like a good plan, and before modern computers and sensors were in play, it certainly was. We do that with the cars we drive. A manufacturer will tell you, for example, to change your oil every 3,000 miles and your transmission oil every 50,000 miles. But these numbers ignore operating conditions. One car may be doing highway driving in dry, cool air, while the next will be city driving in highly polluted, wet, hot air. One car may be driving on flat prairies near sea level, and the other could be in the mountains. Therefore, any experienced operator or tradesman will tell you that the maintenance requirements must be different. There is no way that the oil in these cars will be in the exact same condition at 3,000 miles of travel; yet, they all change out at that distance. In fact, there may be some driving conditions that would allow change out at 6,000 miles and others that require service at only 2,000 miles. This is the critical flaw of preventative maintenance. We base our maintenance on statistical time intervals and ignore the specific operating conditions of the equipment. The two typical results are that we either perform unnecessary maintenance, or we don’t get to the equipment in time, and we have a full failure. The growth and developments in the computer industry have spawned an entire product line that allows the next generation of maintenance methodology. In the first situation, we create unnecessary shutdowns that cost us process and production losses. We employ maintenance staff that could be otherwise better employed. We bring in outside contractors that we really don’t need to hire and pay. We throw out bearings that are perfectly serviceable. And our maintenance budgets are bulging at the seams. In the second case, we are actually operating in a run-to-failure mode and do not realize it. We then face all the problems and costs of that methodology; yet, we are completely unprepared for it, and thus it costs us even more. If our processes are subject to changes, then no preventative maintenance system is appropriate. Our inflow in summer could be 10 or 20 degrees higher than in winter, as could be our operating conditions of motors and pumps. That alone will render a preventative maintenance schedule ineffective. We are in a new era of maintenance. It has snuck up on us slowly as a happy byproduct of a completely different technology advancement. The growth and developments in the computer industry have spawned an entire product line that allows the next generation of maintenance methodology. These computer advances have created smart sensors, information pathways, and computational equipment and software that allow for modern predictive maintenance techniques. One side of the road was run to failure, the other side was preventative maintenance. Think of predictive maintenance as a happy, middle-of-the-road approach that takes advantage of the benefits of both, while eliminating the liabilities. In the water and wastewater industries, like many others, we have moved progressively into automating our processes and equipment. Automation involves condition-monitoring of specific process measurements as well as equipment setpoints. And automation also includes data transmission and central computerization. This process automation is what allows us to move relatively seamlessly into a predictive maintenance system. Predictive maintenance relies on monitoring the actual operational condition of critical equipment and uses the data, and trends in the data, to detect upcoming failures. Failures are rarely instantaneous. 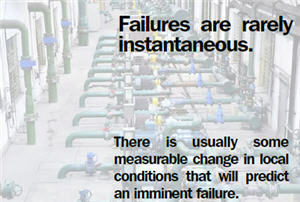 There is usually some measurable change in local conditions that will predict an imminent failure. We can thus run equipment to its natural life cycle and provide maintenance and repair when it is actually needed. It allows planning of the repairs and procurement of parts and services, and it prevents catastrophic failures and collateral damage. This will also reduce process and production losses and eliminate the environmental non-compliances we face when our processes get knocked out mid-stream. This is an opportunity to stay out in front, while the existing developments and technological advancements keep us “behind the plow.” Predictive maintenance, driven by the pharmaceutical and petroleum industries, is becoming mainstream in other sectors. There are numerous companies that can assist in transforming a plant from its current paradigm into a predictive maintenance system. Condition-based monitoring and computerized control systems are already on the market. Many of the sensors currently being used can be easily integrated as condition monitors into a predictive maintenance system. For example, measuring flow from a pump will allow you to determine if the pump is operating properly. If you have to continually bump your variable-frequency drive (VFD) to maintain flow, or if the current draw starts to increase to maintain flow, or if flow or pressure start to drop, that information will be fed directly into the predictive maintenance software. The user interfaces can act as portals for maintenance staff to access the information they need. Predictive maintenance has a side effect — a good one. It will allow you to improve processes, both in quality and efficiency, through better equipment operations, less downtime, and a more complete monitoring of your process conditions. The more information you feed into your predictive maintenance system the better, to an extent. There is always the risk of information overload, and some information simply does not tell you anything about the condition of equipment in your plant. The same holds true with process automation. Occasionally someone sets up an oxidation-reduction potential (ORP) or a level switch that really does not give you information that is indicative of your process. An example is monitoring pH at one end of a tank and adding pH control at the other. Without proper and complete mixing, your control system will not be able to properly maintain a consistent pH. The same is true for condition monitoring in predictive maintenance. All data must be real time, accurate, and pertinent. There are a few items that you will want to include that are not normally a part of process automation. Accelerometers (vibration sensors), for instance, can detect an upcoming bearing failure. Thermal scans will identify hot spots. Each plant is different. Every process is different. 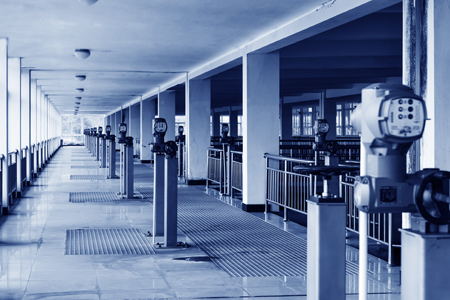 With modern wireless communication systems, incorporating more and different condition-monitoring equipment becomes far less onerous and more economical. There are numerous protocols and systems available, and there are volumes of information available on each. Some condition monitoring can also be farmed out to vendors. Thermal imaging, ultrasonic thickness measurements, and oil analysis are examples of tests that are better handled by people who are properly equipped and do them for a living. Bringing in that level of technology and expertise on a full-time basis would be cost-prohibitive. Bringing in an inspector every month, or three months, or year to walk your plant and take the measurements for you is an economical and highly effective solution. In the water and wastewater industries, most of the tools necessary to implement an effective and efficient predictive maintenance system have been slowly introduced for process automation. We have most of what we need already on site. It’s time for a paradigm change. Every time a new technology comes into use, it is the attitudes of the people involved that must be changed first. The easiest way to drive the change to predictive maintenance is to go slowly, one piece of equipment at a time. Start with the largest, costliest items and work your way through your process from there. Predictive maintenance is not just the future of maintenance; it is the present. We’ve had most of what we need for years. Now it is time to completely implement predictive maintenance into the water and wastewater industries. Paul Brake is a mechanical engineer with nearly three decades of industrial and engineering experience. Brake specializes in the design and maintenance of water/wastewater and process equipment and is currently part of the strategic maintenance team at the North Atlantic Oil Refinery.